I found the recipe for this deliciously refreshing summer cocktail in Sunset Magazine's Fast and Fresh 2010 edition. 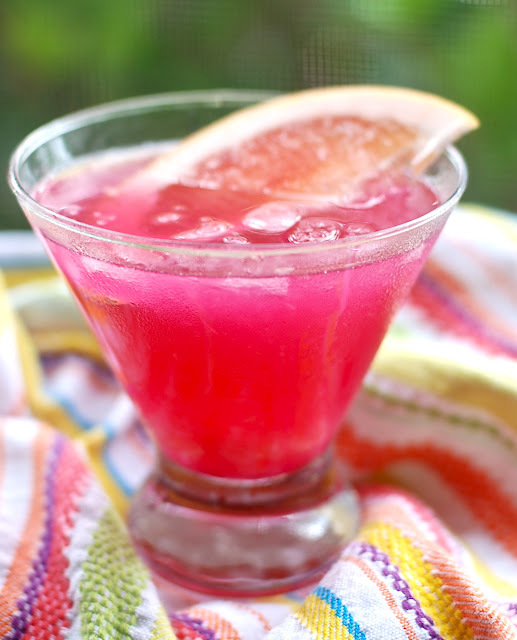 Prickly Pear Cactus Syrup and fresh squeezed ruby red grapefruit give this drink its color and charm. The only trouble I had was locating Prickly Pear Syrup. You could use grenadine but if you can get your hands on this syrup, I highly recommend it. I ordered mine from Cheri's Desert Harvest. Mix grapefruit juice and tequila together and pour into glass filled with ice. Drizzle prickly pear cactus syrup on top. This was before I stirred the drink. Once stirred it became a darker pink and the sweetness of the syrup was more present. Before you say, "eh, I don't care for coconut shrimp", think again... this is NOT coconut shrimp. This, my friends, might just be the best shrimp I have ever been lucky enough to consume, let alone make. This is the second of two marinade recipes that I found in the current issue of Sunset Magazine (Aug 2010). Last night when I made the first one (see my previous post for Chile Ginger Shrimp), I thought "Wow, this is good!" and then I tasted this one. O M G - how can I describe it? Complex with each, separate ingredient serenely coexisting with the others - a happy marriage of flavors. Another thought that came to mind as the scent of lemongrass and coconut milk gently tickled my nose while the shrimp sizzled and seared on the grill, was something my friend Christina Angelone said to me the other day. She said, "That's slap your mamma good!"... and now I understand the true and complete meaning of such a statement. But don't take my word for it - try it out and let me know what you think. 1 can coconut milk, 14 oz. Place lemongrass in food processor and process until finely chopped. Then add shallots, chiles, ginger, and garlic and process until minced. Put lemongrass mixture in glass bowl and whisk in salt, coconut milk, and lime juice and zest. Add shrimp and mix to coat. Cover and place in refrigerator for at least 4 hours, but no longer than 1 day. Grill shrimp at high heat for 2-3 minutes per side or until opaque. Warning: Do not slap your mamma despite how fantastic this shrimp is. Want a super quick and tasty shrimp recipe? Well this is it! In the August 2010 issue of Sunset Magazine there are a couple of marinades that are "Perfect for Seafood". I'm trying them both and this is the first one. 7 ingredients, 15 minutes to marinade and 4-6 minutes of cook time. What could be easier or faster than that? And, oh by the way...it's full of flavor, too! Mix all ingredients together in a glass bowl and allow shrimp to marinade for 15 minutes at room temperature. Grill shrimp for approximately 2 -3 minutes per side or until opaque. You can serve as an appetizer, or over a nice cilantro-lime rice as an entree. The citrus comes through from the lemon and it's balanced by the slight heat of the serrano pepper - Yum! Sometimes two wrongs do make a right. The other day I made blueberry muffins and because I love blueberries so much, I thought, "More is better, right? "...not so much. Too many blueberries and my muffins were a little soggy and sunken in. Anyway, I wrapped 'em up and put 'em in the freezer to be eaten another day. Then my friend Shirley Betz told me about a yummy lemon blueberry frozen yogurt she had made and I thought I'd give it a try. My attempt was not so good. I did, however, stumble upon a tangy lemon fro-yo that I was quite proud of. Okay, so on to the "right" part. Today I was thinking, lemon and blueberry are just a match made in heaven and voila! it occurred to me that the lemon fro-yo would be really good over one of those blueberry muffins. Oh boy, was I not kidding! Talk about refreshing! Since my blueberry muffin track record isn't too good yet, I'm only posting the frozen yogurt recipe. It couldn't have been easier to make thanks to my new handy-dandy attachment for my KitchenAid mixer but you could use whatever ice cream maker you have (thank you to Shirley who steered me in the right direction with this purchase). Literally, you freeze the bowl part, set it in the stand, place the swirly thing in there (aka the "dasher"), pour in your mixture and let her rip. 15 minutes later, I had soft serve frozen yogurt to die for. Scoop the frozen yogurt into a container and store in the freezer. It will be firm in a few hours. Place all ingredients in a mixing bowl and whisk together until blended. That's it. Seriously, that's all there is to making the mixture that you'll put in your ice cream maker. Just follow the manufacturer's instructions and you're golden. Yummy, tangy, citrusy golden. Most everyone has a great muffin recipe. This is one I've been working on and I think it's pretty darn good. The basic muffin is based on a Claire Robinson recipe. 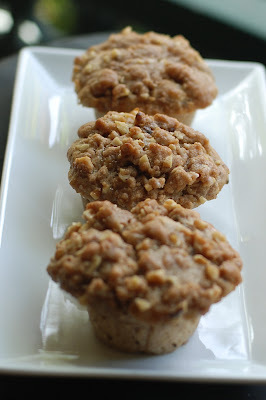 They're sweetened with honey and I've added a brown sugar and nut crumble on top. This time I used a 12 -cup muffin stoneware pan made by Pampered Chef that I borrowed from my friend Lisa Loughran. I may never go back to a regular metal muffin pan. The muffins cooked evenly and didn't over brown. Love it! Mix all ingredients together to form a course crumb mixture, then set aside. In large bowl, mash bananas, add honey and walnuts, mix then set aside. Melt butter in medium-sized saucepan (one that seems too large for melting 2 sticks of butter) over medium heat. You'll begin to see the milk solids separate and a white foam will appear on top. Cook until the milk solids have turned golden brown, stirring occasionally. Keep an eye on this as you do not want it to burn. Browning the butter gives it a deep, nutty flavor. This is about the color you want (disregard the bits on the bottom, it's because I didn't 'occasionally stir' as I should have). Add about half the mashed banana mixture to the browned butter and continue cooking over medium heat for another minute or two. When you first add the banana mixture it will bubble up quite a bit but don't be alarmed, stir it and it will settle back down in a few seconds. This is why you need to use a larger saucepan than you might think, so it doesn't bubble over the sides. Remove pan from heat and whisk this mixture into the bowl of the remaining banana mixture, then whisk in the eggs. Fold in the flour in 2 batches and be careful not to over mix. 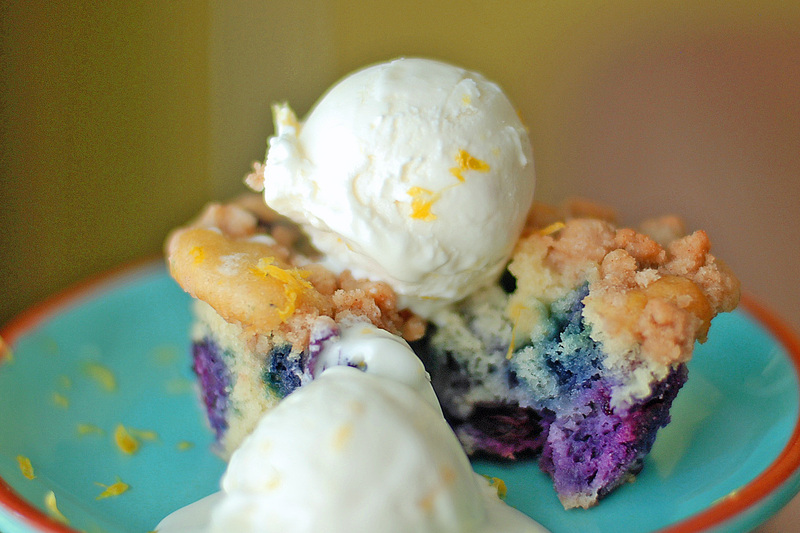 Use an ice cream scoop and place one full scoop in each muffin cup. Topping added and about to go in the oven. Add topping to each muffin, place in oven and bake for approximately 25-28 minutes. To check for doneness, insert toothpick in center of muffin - it should come out clean or with moist crumbs when done. Remove from oven and cool for about 5 minutes. Remove muffins from pan, brush tops with *melted butter and cool on rack. *You could skip this step of adding melted butter, but it adds a glistening moistness to the muffin top once you've frozen and reheated it. In my opinion, it's worth the extra calories. Fresh garlicky basil pesto, tangy heirloom tomatoes, golden Italian cremini mushrooms, bitter radicchio, creamy nuggets of buffalo mozzarella (ciliegine or cherry size) and my favorite addition to any Italian dish...peppadews. Peppadews are small, mild peppers with a slightly sweet/slightly hot flavor. I usually buy them from the olive bar at Whole Foods Market but this time I bought a jar (in the jarred olives section). I prefer the ones that aren't labeled "sweet". The sweet ones are just too sweet for me. They "kick up" the flavor of the dish and I love to add them to my tomato-based pasta sauces. I also enjoy stuffing them with blue cheese and eating them alongside briny olives as an appetizer. This dish is so simple and healthy. 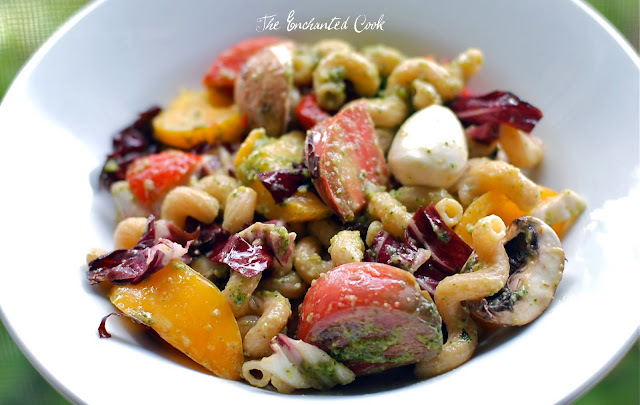 I used all fresh ingredients (organic when possible) and tossed them together with warm cavatappi pasta. You can literally use any ingredients your heart desires. The star of this dish, is really the fresh basil pesto. If you've never made basil pesto yourself, you're in for a treat. It's easier to make than you may have thought and the flavor is infinitely more intense and fresh than what you would buy in a store pre-made. Place basil, pine nuts, garlic and Parmigiano Reggiano in food processor and pulse till mixture is finely minced. With food processor running, drizzle olive oil through mouth of the lid. Final consistency should be that of a moist paste. Add salt to taste. You may store the pesto in your refrigerator for up to 2 weeks. Just place in an airtight container and cover with a layer of olive oil. Cook's note: Parmigiano Reggiano is an ingredient I will splurge on. To me, it's well worth the extra cost and there's NO comparison to other parmesan cheeses. Parmigiano Reggiano is aged for at least 12 months, and you can find it aged for 24 months or even longer. I'm happy with the 12 month variety. Veggie Salad? That's the best name I could come up with?? Well, I didn't want to call it just a "salad" and "using up all the leftover veggies salad" seemed like too long a name. So there you have it. As you might have guessed, this salad was inspired by all the veggies I had that I needed to use up. Breakfast radishes, grilled red corn, heirloom cherry tomatoes, yellow bell pepper, jalapeno, scallions, and some iceberg lettuce - yep, that about did it...fridge cleaned out! 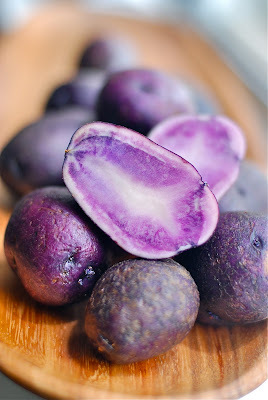 Oh, and the lovely warm purple potato salad. What a great (unintentional) vegetarian meal! I bought these purple potatoes at the Corona Del Mar Farmer's Market in southern California about a week and a half ago (this is why they look a little...well...let's just say..."rugged"). Actually, they held up quite well considering how long they sat on my counter and tonight, I used them in a lovely warm potato salad with a slightly spicy dressing. I made it just as I would have made any other potato salad and it was delicious. The potatoes were creamy and had a depth of flavor slightly more than say a Yukon Gold. Anyway, they were really pretty to look at, too. My friend Pam Granlund told me about this cake so I had to try it. It's gluten-free (hence the "flourless" part) and so creamy and delicious. Think rich, chocolatey, smooth and silky. There are so many ways to complement this rich cake...fresh raspberry puree, homemade vanilla ice cream, or chocolate sauce if you want to slip into a chocolate coma. This time, I opted for whipped cream....mmm. Melt chocolate pieces and butter together until smooth in double boiler or heat-proof glass bowl fitted over pan of simmering water. While chocolate is melting, whisk or beat the egg yolks with the sugar until light yellow in color. Slowly mix the melted chocolate with the yolks, tempering the yolk mixture by whisking in a little of the chocolate mixture at a time so as not to cook the yolks. In a separate bowl, beat the egg whites until stiff peaks form (see Cook's note). This may take a few minutes. Fold egg whites into chocolate mixture and pour into buttered springform pan. Bake for 30 - 35 minutes until toothpick inserted into the cake comes out with moist crumbs. Do not overbake. This cake is best when creamy/soft on the inside. Let stand 10 minutes then release sides of pan. When cake is completely cooled, dust with confectioners sugar. Cook's note: If desired, you may add a small amount of cream of tartar to the egg whites which will help stabilize the whites and form the peaks. Once the peaks are formed use the egg whites immediately. If you allow them to sit too long they will lose their volume and you will have to begin again with fresh egg whites. I've had a lot of good peach cobblers in my day, growing up in Texas and all...but this...THIS peach cobbler...well, it's a real peach! My husband now requests this dessert more often than any other. I've made it 6 times in the last 2 months since peaches have been in season. Tyler Florence was onto something when he came up with this one. I slightly revised mine and below is what I did. If you'd like to follow Tyler's recipe exactly you may find it here - Tyler's Bourbon Peach Cobbler. Mix together in a bowl till peaches are evenly coated and set aside. Place flour, baking powder and salt in food processor and pulse a few times to blend. Chop cold butter into small pieces and place in food processor. Pulse until it's the consistency of wet sand. Add 2 tablespoons of heavy cream and pulse just until dough starts to barely come together. You should be able to squeeze it and have it stick together. Heat 10-inch cast iron skillet over medium-low heat and melt the 2 tablespoons of butter. Add the peach filling and cook until heated through, about 5 minutes. Take small handfulls of dough (about 2 tablespoons each) and squeeze together, then drop onto the top of the peach filling to cover the top, leaving gaps between dough. It will expand as it bakes. Brush the top of dough with heavy cream and sprinkle with sugar. Place skillet on baking sheet lined with parchment paper to catch any drips. Bake for 40 minutes until the top is lightly browned and the peach filling is bubbling. Heat non-stick skillet over medium-high heat with canola oil and saute scallions, green peppers and jalapeno for about 2-3 minutes. Add ginger and garlic and cook for 1 minute more. Remove from heat and set aside to cool. Mix together the crab, lime zest, lime juice, cilantro, egg, 1/2 cup of the Panko, 1 tablespoon of the mayonnaise, salt, and the cooled scallion/pepper mixture. Place the remaining 1/2 cup of Panko breadcrumbs on a plate. Form 6-8 crab cakes with the mixture and roll each in Panko to coat the outside. 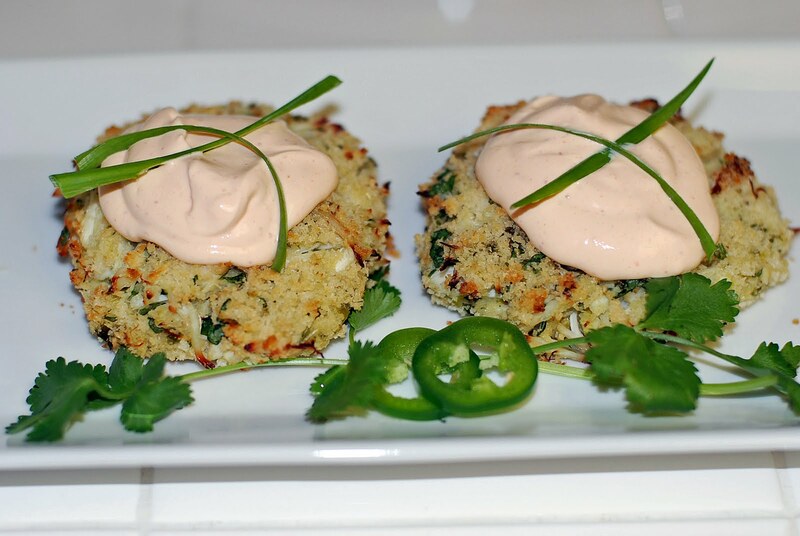 Place crab cakes on sheet pan sprayed with canola oil spray (or lined with parchment paper). Spray tops of crab cakes with canola oil spray and bake in oven for 10 minutes. Gently turn crab cakes over and spray other side with canola oil spray and bake for another 10 minutes or until lightly browned. Mix together in small bowl and set aside. 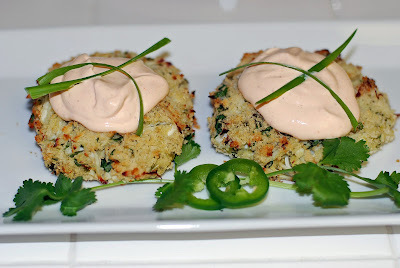 To serve top each crab cake with a dollop of the spicy cream and garnish with extra cilantro. Serving size = 2 crab cakes. I just love the scent of toasted sesame oil. For me, it reminds me of the times I've gotten to enjoy really good Korean food. The moment I started assembling this marinade, I was overwhelmed by the luscious, rich scent of fresh ginger, garlic, soy and, of course, sesame...wow...and yum. Baby bok choy seemed like a natural accompaniment and since I was grilling the steak, I opted to grill the baby bok choy with a little grapeseed oil, Kosher salt and fresh cracked pepper. Combine all ingredients in zip top bag, seal, mix well and be sure both sides of steak are coated. 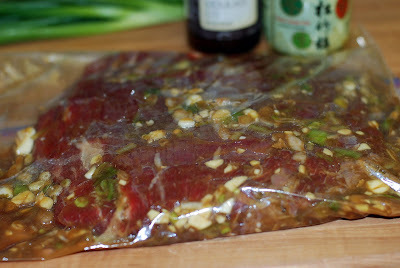 Leave out on counter and allow steak to marinade and come to room temperature - about an hour. 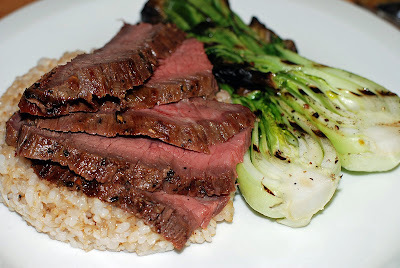 Remove steak from marinade and discard marinade. Sprinkle Kosher salt and fresh cracked black pepper to both sides of steak. Place steak on well-oiled grill. (Be sure to use vegetable oil, or other oil that has a high smoking point, to oil the grates of the grill.) Allow to cook for approximately 3-4 minutes per side for medium to medium rare. Depending on the thickness of your steak, you may need to increase or decrease your grilling time. Oh boy, was this refreshing and delightful! Perfect after a day in the sun. I normally only have one cocktail, however, this one left me wanting another. I found this recipe in Sunset's Fast & Fresh. Thanks to my friend Cristina Heustis for telling me about the magazine - it's chock full of..well, fast and easy recipes! 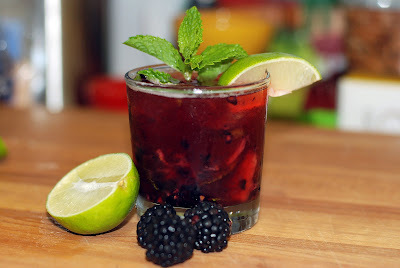 *Muddle blackberries, pineapple, mint leaves, ultrafine sugar and lime juice in bottom of glass. Add rum and stir. Add club soda and ice, garnish with fresh mint sprig and wedge of lime. 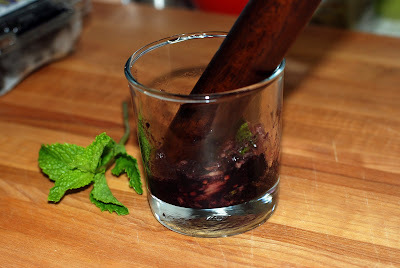 *To muddle - use wooden spoon handle or a muddler and mash ingredients together to blend. Cook's note: If you don't have ultrafine sugar, just make a simple syrup using equal parts sugar and hot water (2 1/2 tsp sugar + 2 1/2 tsp hot water). The hot water will dissolve the sugar.